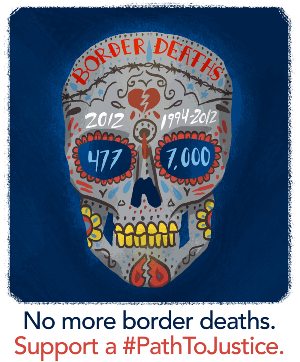 On the eve of Dia de los Muertos (Day of the Dead), let's join with border communities to call for an end to border militarization. For many years, on Dia de los Muertos, Nov. 2, we have taken time to recognize and reflect on the lives of loved ones, friends and others who have passed on. And we have paid particular tribute to the thousands of people--men, women and children--who have lost their lives under the most tragic circumstances: crossing the dangerous terrain at the U.S.-Mexico border. There are certainly many issues at play when we think about those who risk their lives to cross without immigration documents, and under uncertain, unsfafe circumstances: the backdrop of poverty and unemployment, violence and war, discrimination and persecution of all types, coupled with the lack of legal immigration opportunities and punitive border policies. With immigration reform stalled--and without anything on the horizon that resembles fair and just reforms, much less safe an sound border policies--we need to lift up awareness about the negative impacts of current policies on border communities and on those who must cross borders. The rights and lives of border communties, and those who cross borders, with or without documents, cannot be "thrown under the bus" in the name of a dubious "immigration reform." The CAMBIO coalition has launched its Path to Justice initiative to support fair and humane immigration reform. One of its first roll outs has been the popularization of the image (above) for Dia de los Muertos. Read the full statement here and click here to find out more about the campaign and to download images and tools that you can use. A new campaign from the Southern Border Communities Coalition, Revitalize Not Militarize aims to ensure that the voices and interests of border communities are included in the debate on immigration reform. "The border is more than a line, it is the home of 15 million people, it is a cornerstone of the U.S. economy, and it is a unique cultural and historical space that is sacred to many who live here. The border enforcement bills that have been proposed as part of immigration reform would result in nothing more than a militarization of our communities, and is not what we need or want” stated Pedro Ríos, Director of the American Friends Service Committee’s San Diego office which is a member organization of the SBCC. Click here to learn more about this campaign and its new projects -- the border quilt, and the "flower power" initiatives. The U.S.-Mexico border is not the only crisis point. Only last month, while the UN was engaged in its High Level Dialogue on International Migration and Development, news came that hundreds of African migrants had drowned off the coast of the island of Lampedusa, Italy. Within a week, another boat of migrants floundered in the same area, and even more migrants lost their lives. This morning--a news report in the New York Times that the remains of some 92 African migrants had been found in the Sahara--men, women and children stranded when crossing the desert. They were thought to be from impoverished Niger, in West Africa.